Hi guys! 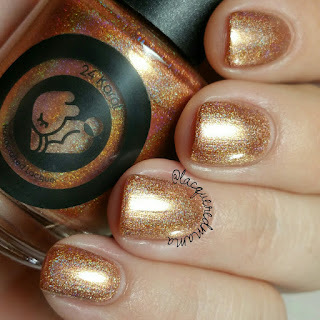 Today I have a beautiful collection from 24 Karat Lacquer to share with you! 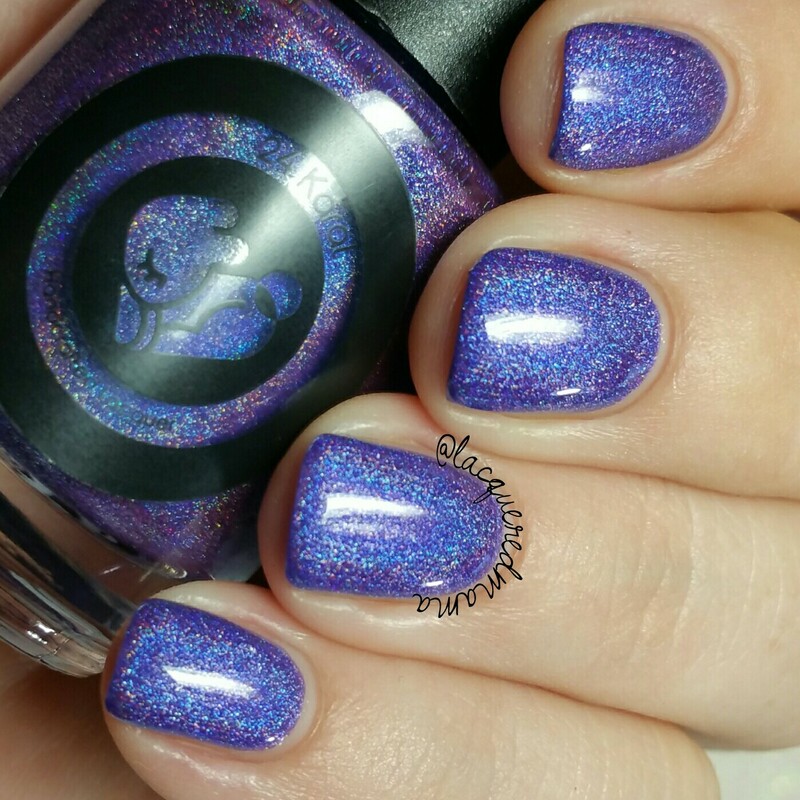 The Holo Symphony Collection consists of six linear holographic polishes! This is the first time I've tried this brand and I'll just start by saying that I am impressed! 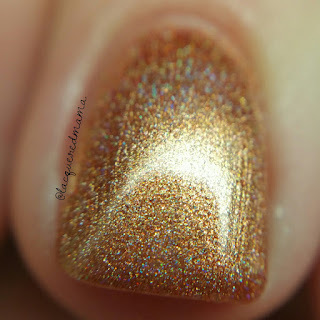 Grandioso is a gold/bronze linear holo with a fantastic formula! Here I did just one coat plus topcoat! Depending on your application, you may need a second. It did dry slightly dull, but a good glossy topcoat shines it right up and makes that holo sparkle! This also removed easily. Fantasia is a glorious fuchsia, almost hot pink, linear holo with an even better formula than Grandioso! This little lady is most definitely a one coater! I think you could be horrible at application and this would still be a one coater for you! Again, topcoat is needed to really make it shine and it removed easily. Passionato is a deep royal purple linear holo! It's sort of like a blurple, but on the more purple side. Another super pigmented polish that I got away with one coat on. This may need two depending on how you apply it, but I think it's unlikely. Also easy to remove. 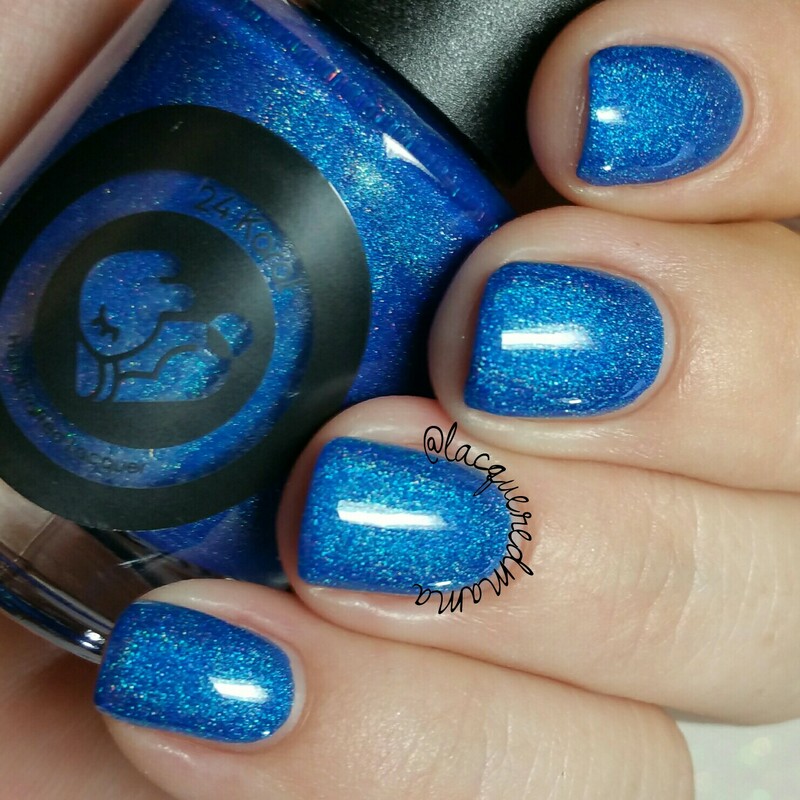 Symphonic is a beautiful cerulean blue linear holo! I sound like a broken record, but I don't know any other way to say that it is a one to two coater. For my photos I did just one coat plus topcoat and it was easy to remove. 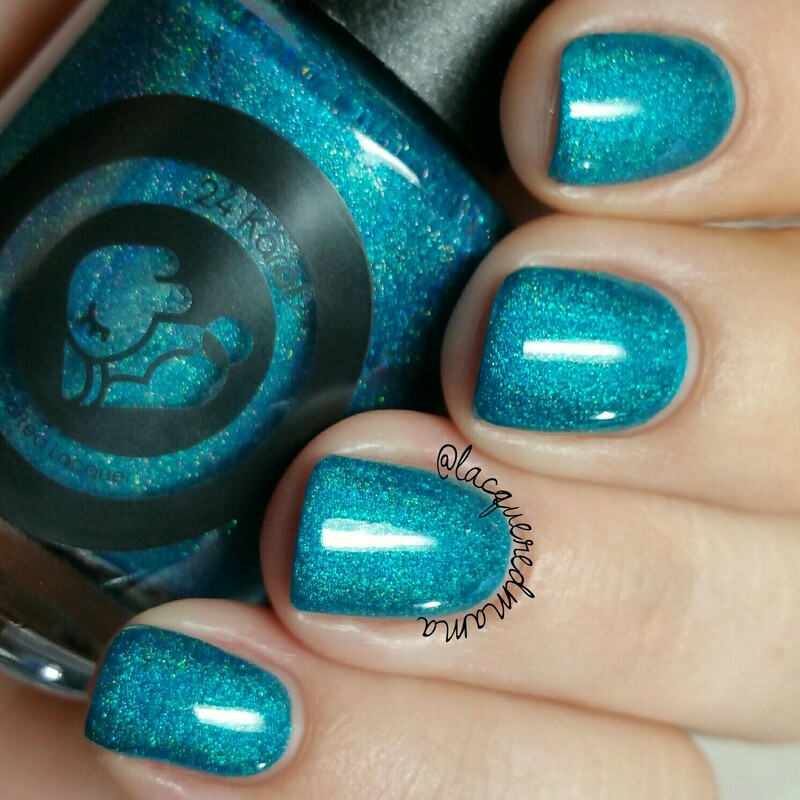 Dolce is a gorgeous dark teal linear holo! I say it again.....great formula that was opaque for me in one coat. You may need a second depending on application. This also dried slightly dull, but glossy topcoat fixed it up and it removed easily. 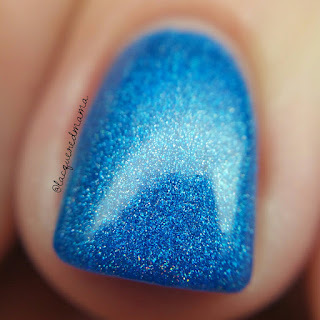 Serenade is a silver linear holo! This was the only one in the entire collection that was not close to being a one coater. For my photos I did two coats plus topcoat! Do they stamp? Oh yes they do! They show great over both black and white, but are particularly pigmented over white. The silver and the gold also stamp just as well, but I mistakenly deleted those photos. Awesome collection! Every polish was super smooth and easy to apply. 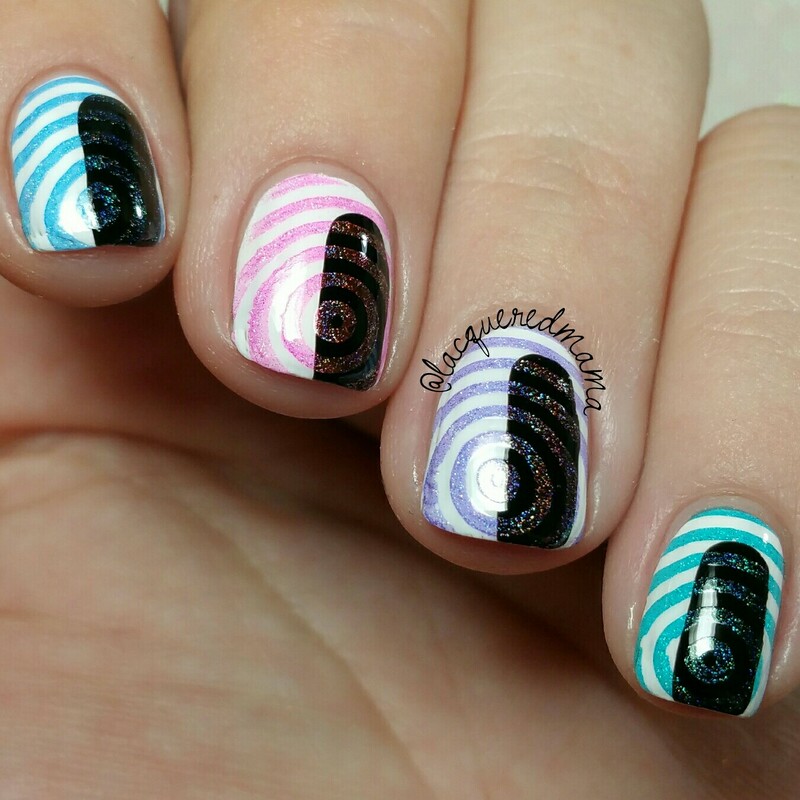 My nails don't stain easily, so I didn't have any issues, but because they are highly pigmented I would be safe and wear a base coat. The Holo Symphony Collection is available in 24 Karat Lacquer's shop now!